After some searching I found out nobody found a solution to get rid of the Windows language bar using policies. 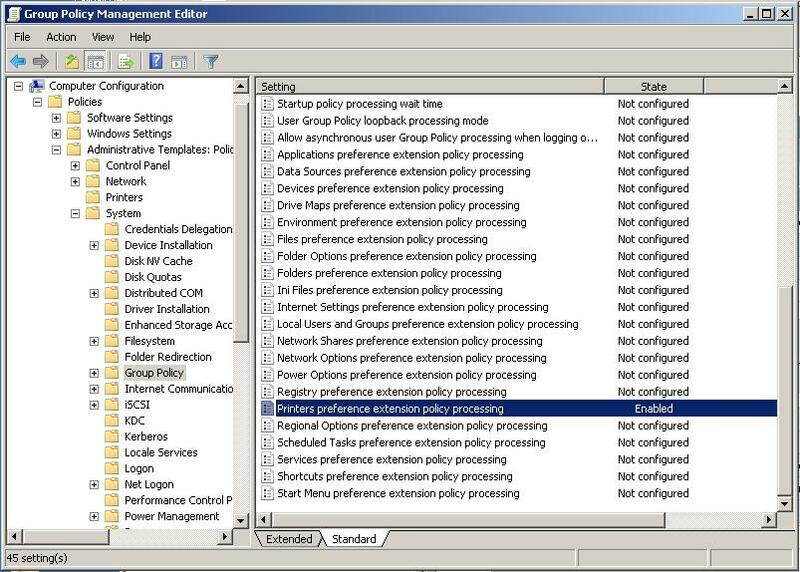 When deploying user settings using Group Policy Preferences (GPP) I actually managed to get this done! Save the following text as settings.XML, create and open a new group policy object in Active Directory and drag the XML file into the registry portion of the user settings. Now you should see a bunch of keys which will be deleted and/or updated. One more thing, you need RES Workspace Manager because the settings need to be applied before explorer.exe is started.. Please let me know if this post helped you! What to do when your domain controllers don’t sync time ery well?? The following registry entries must all be changed in order to set Internet Explorer as the default browser and pass the ‘Would you like to set Internet Explorer as default browser’ popup. Yesterday I was searching the web for a script that would disable the client for Microsoft networks and some other protocols. I could not find it in the first 10 pages of my search on Google. Last week I discovered that RSAT cannot be installed on Windows 7 SP1 because of some stupid install check. * Unpack the .MSU with 7zip or another unzip utility to let’s say c:\TEMP\RSAT. * Now watch the taskmanager the process pkgmgr.exe until it automatically closes (this will take several minutes). * Go to the control panel and in Programs and Windows Features you can add the desired feature you want. Note: when you’ve got RSAT installed on your computer prior installing Windows 7 SP1, then RSAT will already be available and you don’t need this workaround. What seems to be a major problem is ‘remembering’ the default printer when using replace option. The default behavour of Windows is the first added printer is being set as the default. To resolve this, i’ve created a script (with some help from a great collegue). You do need te have a roaming profile or a tool like Immidio profiles to save current use keys. Add the logon.vbs and the logoff.vbs scripts to the user policy. Set the c:\windows\system32\cscript.exe as application with the logon.vbs as a parameter. Logoff.vbs reads the key HKEY_CURRENT_USER\Software\Microsoft\Windows NT\CurrentVersion\Windows\Device and cuts it into pieces. It creates some keys in hkey_current_user\software\ictivity. These keys are being ‘read’ at logon and after a while (this time can be set in logon.vbs) the last used printer is set as default. WshShell.RegWrite "HKCU\SOFTWARE\Ictivity\" & strPrtName, strValue(0), "REG_SZ"
WshShell.RegWrite "HKCU\SOFTWARE\Ictivity\" & strPrtSpool, strValue(1), "REG_SZ"
WshShell.RegWrite "HKCU\SOFTWARE\Ictivity\" & strPrt, strValue(2), "REG_SZ"
The last thing to do is changing the computer policy. Windows will refresh the policy en thereby also readd the printers. This will result in a wrong default printer. Today I had this weird problem because of some stupid brain farts by the Microsoft developers team. So you’ll have a folder with in my case hundreds of my documents folders..
You definitely don’t want this behaviour! Apparently this is by design http://support.microsoft.com/kb/947222. When you take a look at this article you really want to choose between creating a subfolder under the redirected folder in the Universal Naming Convention (UNC) path. The best method is the third one from the article: Do not grant the Read permission to the administrator for the Desktop.ini files on the server. Note If more than one Desktop.ini file exists, follow these steps for all the Desktop.ini files. Right-click the Desktop.ini file, click Properties, and then click the Security tab. In the Group or user names pane, click Administrators. Click to select the Deny check box for the Read permission. Thanx to this great blog by Richard Willis!! Today my customer wanted to have the volume icon in the taskbar enabled. Easy, was the first thought. But during my search i investiogated it was a bit harder. This little vb-script shows the Asset tag / part number of serial number of your Dell computer. Today i discovered a solution for a problem with my own laptop. Windows update comes with the error 0x8024000C when i manually click on Windows Update. 'objCommand.CommandText = ";(objectCategory=User)" & ";adspath;subtree"
'Onderstaande CommandText is om mee te testen. objCommand.CommandText = ";(objectCategory=User)" & ";adspath;subtree"
'Append de datum en tijd in het tekstbestan met een witregel ervoor en erna. 'Loop door het recordset en verander van iedere gebruiker die een homedrive op J heeft naar de fvs-01 de homedirectory. 'Schrijf alle usernames en homedirectories die aan de gebruikte if statement voldoen naar een tekstbestand. 'Zet de te gebruiken waardes weer op nul, anders worden de waardes gebruikt voor accounts die geen homeDirectory hebben. The following script can be used as a scheduled task on workstations. It deletes old Windows Update backup files which are morely overhead than useful. oShell.RegDelete "HKLM\SOFTWARE\Microsoft\Windows\CurrentVersion\Uninstall\" & sUpdateName & "\"
oShell.RegDelete "HKLM\SOFTWARE\Microsoft\Windows\CurrentVersion\App Management\ARPCache\" & sUpdateName & "\"
' MsgBox "The uninstall data for the following updates are now removed:" & vbCrLf & UCase(sDeleted), vbOKOnly + vbInformation, "Files Removed"
' MsgBox "No Windows Update Folders found for removal", vbOKOnly + vbInformation, "Nothing To Do"
For my unattended XP installation i was searching for a script which could easily change the provider order. My cutomers use the Novell client a lot, but i want the Microsoft Client to be used first. Here’s the great script created by Anders Olsson, Kentor Teknik AB. Thanx for the great work man!!
' the "Microsoft Windows Networking" provider on top.
' Example: Before - "NCredMgr,NetwareWorkstation,RDPNP,LanmanWorkstation,WebClient"
' write LanmanWorkstation, since it's already written at the start of the string. Use this script and 2 textfiles which can be used to exclude files and folders.